The 12.55, pm. Up electric passenger train from West Croydon to Victoria was passing through the junction at about 20 m.p.h. under clear signals when the 9.41 am. Up steam parcels train from Brighton to London Bridge, which was approaching the junction on the converging line from East Croydon, came into sidelong collision with it. The steam train had overrun by about 150 yards the protecting signal which was at danger and it was travelling at 10-15 m.p.h. when the collision occurred. There were few passengers in the electric train and 5 of them and the guard received slight injuries or suffered from shock. They were taken to the Croydon General Hospital without delay but were discharged the same day. The parcels train comprised 12 vans weighing 364 tons, drawn by an “N” class 2-6-0 type engine which was driven from the right hand side and weighed 92 tons. The steam brake operated on the engine and the vacuum brake on all the vans, and they exerted a pressure of 332 tons or 73% of the gross weight of 456 tons. The brake van, which was the second vehicle from the engine, was fitted with a periscope. The engine sustained some damage and its leading driving wheels were derailed. The drawbar hook between the seventh and eighth van was broken. The electric train was a 4-coach set weighing 133 tons and the engine of the steam train struck and derailed the third coach, the body of which was forced from the underframe against the adjacent high ground on which it lay at an angle of over 4S0 to the vertical. The rear bogie wheels of the second coach and the front bogie wheels of the rear coach were derailed, and both these coaches were also damaged. The derailment broke the hook switch and cable lug on the conductor rail on the Up West Croydon line, on which the passenger train was travelling, causing the current on that line to the point of collision to be cut off. The electric pressure was not removed from some of the adjacent lines until 1.13 pm., and from others nine minutes later. As a result of the collision the junction was blocked until 11.40 pm. and normal working was resumed at 11.53 pm. In the meantime many trains were passed over diversionary routes but the train service between West Croydon and Norwood Junction was suspended, passengers being conveyed between these points by the trolley-bus service and by a special bus service which was introduced between West Croydon and Crystal Palace. The sketch opposite illustrates the layout of the tracks and the position of some of the 4-aspect colour-light signals on them in the complicated area controlled by Gloucester Road Junction box. This box is provided with an electrically locked power frame from which all the points and signals in the area are operated. The Up Local line from East Croydon, on which the steam train was travelling, falls at a gradient of 1 in 137 from points No. 92 to just beyond points No. 9, and from there to the converging junction ahead the gradient steepens to 1 in 90 and the line is partly in cutting. From points No. 92 onwards the line curves first to the left and then to the right, at radii of 19 and 32 chains respectively. signal No. 10/11 is red, signal No. 88 also is approach controlled from red to yellow by track circuit AX. Signal No. signal No. 88/89 and thus enables an 8-car electric train to stand at it and be clear of the fouling point in rear at points No. set for a train to or from West Croydon, but there is no such interlocking between lever No. 88 and the junction points. It will be noted that from the right hand side of an engine signal No. 10/11 comes into view 22 yards before signal No. consequently the delayed clearance of the signal is not observed. The electric train and the parcels train were correctly signalled from West Croydon and East Croydon respectively to Gloucester Road Junction and the junction signals were cleared for the electric train. The normal route for the parcels train is over the East Croydon Local Spur line, but the engineering department had had daily possessions of this line for the repair of a bridge for a number of months, and consequently the train was to travel over the West Croydon Spur line. This alteration in routeing had been correctly notified to all concerned. Levers Nos. 90 and 88 were pulled for the parcels train to allow it to draw up to signal No. 10/ 11 and the aspects changed from red to yellow when the respective approach controlling track circuits were occupied. Signal No. 10/ 11 was red, the levers being locked normal because the junction ahead was set for the electric train from West Croydon. The parcels train, however, ran past this signal and arrived at the junction as the electric train was passing over it. The engine crew of the parcels train were Driver J. Killick and Fireman J. Taylor, both of Brighton Motive Power Depot. They had worked together for about eight months and had come on duty at 9.10 a.m. on the morning of the accident, having been on rest the day before. Killick, who is 61 years of age, has 43 years' railway service and has been a driver for 13 years. He knew the route well and said that he had read the notice about the diversion at Gloucester Road Junction. The train left Brighton on time and had a normal run to East Croydon where it arrived at 12.45 pm. Several stops were made en route and some vans were attached, and the brakes were tested on each occasion and found satisfactory. The engine was in good order. The train left East Croydon at 12.56 pm. on the Up Local line and Killick said that he approached signal No. 90 slowly with the regulator shut and saw its aspect change from red to yellow at about half-a-train length distant; he also saw the left-handed direction indicator become illuminated. He re-opened the regulator but shut it again very soon when the engine had passed points No. 92 and was on the falling gradient. Killick said that Taylor first saw signal No. 88/89 and reported that it was yellow. Shortly afterwards Killick himself saw signal No. 10/11 at red and No. 88/89 at yellow. He thought that he also saw the right-handed direction indicator on the latter signal illuminated and he assumed that the train was being sent on its usual route over the East Croydon Local Spur. He soon, however, realised that the train was not going that way and that it would pass signal No. 10/11 at red, and he made a full application of the brakes. He said that the speed was then only about 20 m.p.h. but the distance to the junction on the steep falling gradient was too short to stop the train, although he thought that its speed was reduced to about 10 m.p.h. when the collision occurred. Killick said that Fireman Taylor had not mentioned the direction indicator on signal No. 88/89, and he used the following words in connection with this indicator. "I thought that I had a lunar light which would have taken me round the East Croydon Up Local Spur, but apparently that was not so. Whether it was a trick of the light I do not know." He said that he did not notice the banner flag which was on the East Croydon Spur line and, having gained the impression that the lunar lights in the direction indicator were illuminated, thought that the engineer's "block" might have been removed. He was insistent that he had not forgotten about the re-routeing of the train. He stated that he did not rely on Fireman Taylor altogether to look for signals although he did ask him about some signals which were seen more readily from the left hand side of the engine, such as signal No. 88/89. He said that he was actually teaching Taylor the signals and was intending to point out to him the next signal on the East Croydon Spur line. Killick had not mentioned to Taylor the fact that the train was to be diverted. Fireman Taylor, who was on the left hand side of the footplate, first saw signal No. 88/89 when it was at yellow, and he reported the aspect to the driver. He expected to see the direction indicator on that signal illuminated for the East Croydon Local Spur line. He said, however, that the direction indicator was definitely not lit up but he did not tell the driver about it. As the parcels train emerged from the cutting he saw the electric train ahead and shouted to the driver, but the latter had by then applied the brakes. The responsibility for this accident rests on Driver Killick for failing to stop the parcels train at signal No. 10/11 which was red. He had seen the notice and knew that the train was not to follow its booked route over the East Croydon Local Spur line at signal No. 88/89, and he was certain that he had not forgotten about this diversion. He thought that he saw the right-handed direction indicator on that signal illuminated but he must have been mistaken because the route was set for the Up Local line. I think that the only possible explanation is that Killick got momentarily confused as to which route his train was to take. As soon as he realised that it was going straight on to the junction he applied the brakes fully, but by then the engine had reached or had even passed the protecting signal, and the collision could not be avoided. mentioned the fact that the indicator was not alight. The severe curvature of the line, coupled with the obscuring effect of smoke and steam on the periscope of the brake van which was the second vehicle from the engine, made it difficult for the guard to observe the signals, and I do not think that any responsibility can be attached to him. The fact that the electric pressure was not removed from the lines adjacent to the line on which the accident occurred until sometime later was the result of a misunderstanding between the two signalmen in Gloucester Road Junction box. I am assured that steps have been taken to prevent a recurrence. The signalling of the Up Local line is not a simple matter because, as already mentioned, it is necessary for operating reasons to ensure that an 8-coach electric train waiting on it to give preference over the junction ahead to a West Croydon train, is clear of the crossing of points No. 92 in rear, and it was for this reason that signal No. 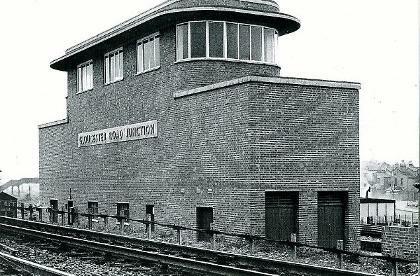 10/11 was provided, only 106 yards from the fouling point of the Down West Croydon line, when the new colour-light signalling arrangements were brought into use in 1954. Signal No. 88/89 was installed a short time later because drivers found the close proximity of signal No. 10/11 to points No. 9 was confusing They had to obey the signal when travelling towards the converging junction and disregard it when routed via the East Croydon Local Spur. becoming confused by the closeness of signals Nos. 88/89 and 10/11. (a) The approach track circuit on signal No. 88/89 is to be split so that when the signal ahead (No. 10/11) is at danger signal No.88 will not clear from red to yellow until the train is about 50 yards from it. replaced too soon after a train has passed the signal. Item (a) will ensure that a driver will have a reasonably long view of signal No. 88/89 at red, even from the right hand side of a steam engine, and should invariably see the aspect change. He should therefore he in no doubt as to which route his train is to take and an overrun beyond signal No. 10/11 is less likely to occur. Item (b) will ensure that if there is an overrun beyond that signal, a collision cannot take place as the movement will be isolated by the setting of the points in the Up and Down West Croydon lines. Taken together, therefore, these two alterations will to a large extent preserve the operating facilities by enabling trains to be drawn up to signal No. 10/11, and they should entirely eliminate the possibility of a recurrence of an accident of this type. I am informed that the work is already in hand.